Free Shipping on this item to locations with normal delivery access in the U.S. 48 states; locations in Alaska, Hawaii, and outside the U.S. require additional shipping charges. Locations with limited access may require pickup at your local terminal for free shipping. For Truck shipments, you must be able to unload the items at the delivery point (lift gate service is extra, please order if needed). Delivery pickup at the terminal can also be requested. *We have a credit card sales limit of $1500.00 or less. All orders over $1500.00 should be paid for by personal, business, or cashier's check, postal money order(s) or finance contract (see our web page for financing options). Both 3 ft. and 4 ft. wide models are available with either the standard agressor teeth style rotor or with the Sabre Tooth style rotor. See the drop down menu above for ordering the 3 or 4 ft. model, and with the teeth you want. Designed for use on Mini / Compact Skid Steers, the hydraulically driven 05-Series offers economy and performance. flip-up side shields and single center mounted gauge wheel – all supported by a 3" x 3" x 3/16" all-welded frame. 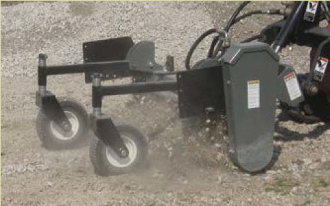 As with all models, these Power Rakes feature an environmentally friendly dry chain case, reducing maintenance costs.